On the road to Spring Quilt Market 2011! Wednesday May 4th, my designer friend Sandy Fitzpatrick Hissyfitz Designs and I flew to Denver and were driven by Mary Corcoran (see the bio on my website) to her home in Laramie, Wyoming. 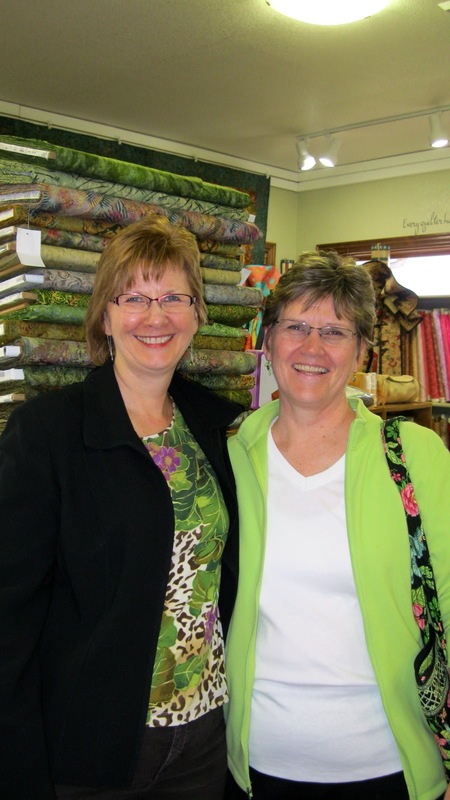 Tonight is our first event at the quilt store in town, Quilt Essentials. Owner Mary McDonald has been remodeling the shop since I was last here in September. It is beautiful! Tonight the three of us are having a Trunk Show and Tell at the store. Tomorrow we will be doing 30 minute demos in two parts of the stores. Monday Sandy will be teaching machine quilting and that evening I will be teaching the Two Hour Tulip Purse pattern. We stopped a one quilt store on the way from Denver to Wyoming as we had heard they carried the Tulip Purse. It is in Windsor, and is called Quilters Stash. While there, we got to visiting with another customer and learned once again what a small world it is! The store customer, who now lives in Virginia, was from this area. She said her husband was from Burlington, NC. I shared that I, too, was from Burlington. What fun to continue the questions and to discover that her husband and I had gone 12 years of school together! Her name is Kim Jones, and her husband I remember so well from school, Keith Jones. Kim and I had our photo taken and I will always remember visiting with her that day. Next week we move to Park City, Utah, a ski resort area 30-45 minutes outside Salt Lake City, Utah. I will add more blog posts as the week goes on!